The passionate queerdos that comprise burlesque/drag collective BEEFSquad have cooked up yet another performance creation for you, just in time for pride. So, rather than bowing to the forces of rainbow-tinged capitalism as more and more brands trumpet just how proud they are of everyone (while really also saying, by the way, you should buy their stuff), perhaps consider supporting local independent queer performers instead. A BEEF show is always full of surprises, from the salacious to the scary, and Friday night’s show hosted by C’etait Bontemps and Angelica Frankenstein should be no different. Maybe you’ve seen Sleep No More, the consistently buzzed-about immersive Shakespeare-inspired show (and now, essentially tourist attraction) that gives you a Phantom of the Opera-esque mask and takes you on a spooky journey of dance, intrigue, and intimate encounters (sometimes too intimate). or, maybe you couldn’t afford it—fancy immersive theater regretfully doesn’t run cheap. 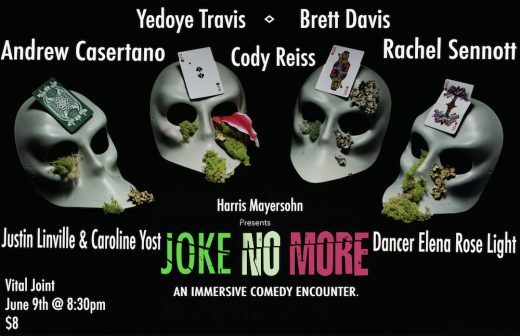 Whoever you are, you’re invited to experience the more comedic side of interactive performance at Harris Mayersohn’s Joke No More. 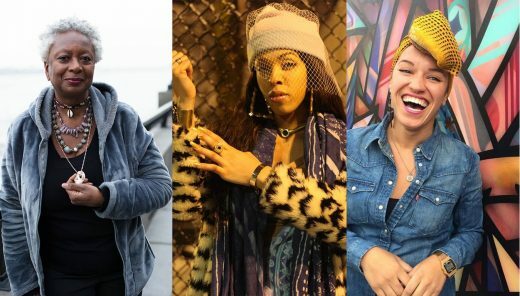 Down in the basement of East Williamsburg’s Vital Joint, you’ll be given a mask (of course) and treated to special one-on-one performances from the likes of Brett Davis, Justin Linville, Yedoye Travis, Caroline Yost, Rachel Sennott, Andrew Casertano, Cody Reiss, and dancer Elena Rose Light. Last year, La MaMa’s queer performance festival Squirts sought to bring artists from different generations together by literally presenting older and younger performers of similar disciplines on the same bill, giving them the chance to intermingle and share space. This year still focuses on queer performance across generations, but is organized a bit differently, with different curators for each night of the festival. Eva Yaa Asantewaa will present an evening of “improvised dance” from four artists, the House of LaBeija shines a spotlight on members of the seminal vogue collective (featured in films like Paris Is Burning), and Shannon Matesky of the Queer Abstract series organizes a night of theatrical performances inspired by Nina Simone.